Finding a banded woolly bear caterpillar during a walk in the woods leaves no doubt that autumn is upon us. These familiar black and reddish-brown caterpillars are larval Isabella moths. By Sillyputtyenemies (Own work) [CC BY-SA 3.0 (http://creativecommons.org/licenses/by-sa/3.0) or GFDL (http://www.gnu.org/copyleft/fdl.html)%5D, via Wikimedia Commons. By IronChris (Own work) [GFDL (http://www.gnu.org/copyleft/fdl.html), CC-BY-SA-3.0 (http://creativecommons.org/licenses/by-sa/3.0/) or CC BY-SA 2.5-2.0-1.0 (http://creativecommons.org/licenses/by-sa/2.5-2.0-1.0)%5D, via Wikimedia Commons. By Broly0 (Own work) [CC0], via Wikimedia Commons. The woolly bears that we see in the fall are the second generation of woolly bears for the year; the first generation hatched out in May. This second generation of woolly bears emerged back in August. Since then , they have eaten leaves from a variety of plants from grasses to clover to trees and sunflowers. Once the cold weather hits, the woolly bear finds a sheltered spot like rotted log, or under a rock, or in a pile of leaves, to overwinter. When the temperatures drop below freezing, woolly bears also freeze. Fortunately woolly bears have a cryoprotectant, a natural sugar-based antifreeze which protects the caterpillar’s tissues from being damaged when it freezes. In spring, woolly bears emerge from their sheltered spot, eat a few more leaves then make their cocoons and undergo metamorphosis to become an Isabella moth. By Andy Reago & Chrissy McClarren [CC BY 2.0 (http://creativecommons.org/licenses/by/2.0)%5D, via Wikimedia Commons. Folklore has it that woolly bears predict the severity of the upcoming winter based on the proportion of black and reddish brown banding on the caterpillar’s body. A thin reddish brown band means we are in for a tough winter. But is this folklore true? 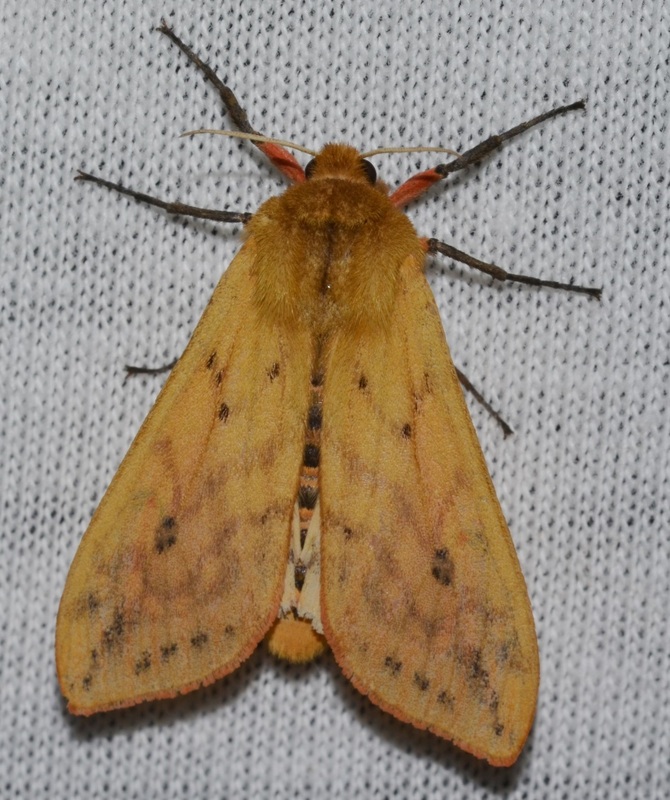 Dr. C. H. Curran, curator of insects at the American Museum of Natural History in New York City (1928-1960) traveled to Bear Mountain State Park in 1948 to find out. On a single day, he gathered as many woolly bears as he could find, compared the reddish brown segment to the black segment, then reported his findings and a winter weather prediction to a reporter at the New York Herald Tribune. Dr. Curran continued his study for eight more years and was never able to conclude whether the woolly bear was able to predict the winter. More recently scientists have found that the size of the reddish-brown band increases as caterpillar matures and that wet weather increases the size of the black bands. While woolly bears may not be an accurate forecaster of the upcoming winter, they are still a delight to see during a visit to a park. Perhaps you’ll see one curled in a ball or looking for the next leaf to eat. Post by Susan Carver, OPRHP. Up close observations of bald eagles are rare and usually reserved for biologists and dedicated naturalists, however if you have been to Trailside Museums and Zoo at Bear Mountain State Park over the last 30 years, then you have probably had an intimate encounter with Samantha, our impressive resident bald eagle. Affectionately known as Sammi, she has been greeting visitors since 1985. Her story began in southeastern Alaska in the early spring of 1984. In the nest, her mother laid two eggs several days apart. Both parents took turns keeping the eggs warm and hunting for food. About thirty-five days later, Sammi and her sibling hatched from the eggs. Mom and Dad hunted continuously to feed their very hungry baby eaglets and themselves. The eaglets grew bigger and stronger and soon they would be getting ready to learn to fly, also known as fledging. Meanwhile, Research Scientist and Endangered Species Unit Leader Peter Nye and a team of biologists from the New York State Department of Environmental Conservation’s (DEC) Endangered Species Unit had traveled to southeastern Alaska. As part of New York’s Bald Eagle Restoration Project, they collected nestling bald eagles from 1976 through 1989, restoring New York State’s declining eagle population, which had been decimated by hunting, habitat destruction and widespread use of the pesticide DDT. On July 17, 1984, Mr. Nye climbed up Sammi’s tree and collected her and her sibling. They were put into crates and transported, along with 30 other young eagles, back to New York State. 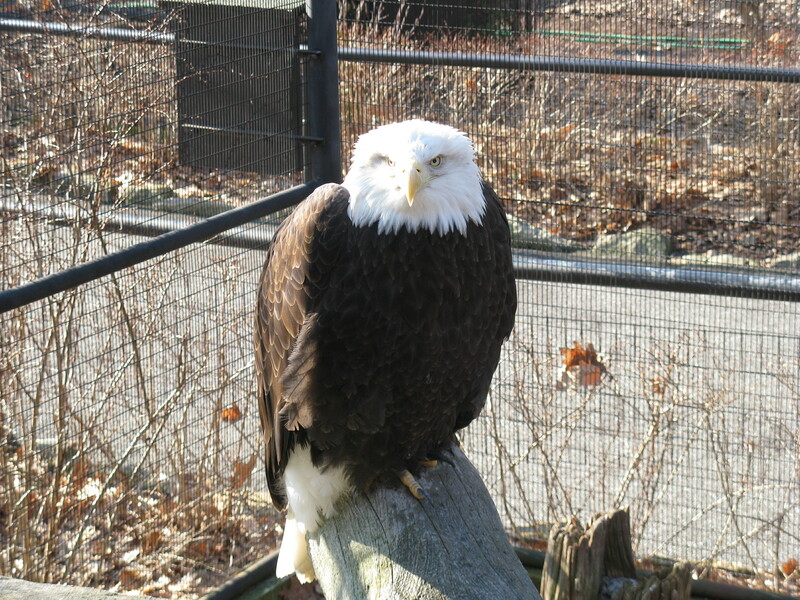 Sammi and about half of the eagles were transported to a site in the Adirondacks, while the others went to a site in Albany County. The young eagles were raised to independence through a process called hacking. Living in artificial nests, called hacking towers, they were fed by hidden human hands, until fully feathered, when they were released to learn to fly and hunt from the towers. Sammi was released on August 31, 1984. She fledged from the tower on September 2 and returned to it on September 7. She left the hacking area entirely on September 20. DEC personnel last had contact with her on November 2 on Sacandaga Reservoir, near Northville, NY. Winter was coming, so Sammi migrated south. Unfortunately for Sammi, she would barely get to know the usual rewards for migrating south, warmer weather and open water for fishing. She was found injured on the ground on December 27 in Woodleaf, North Carolina by a private citizen. She was taken to Dr. Brown of the Carolina Raptor Rehabilitation Clinic, where it was discovered that she had been shot with a .22 caliber firearm, which broke one metacarpal in her right wing. Dr. Brown and his staff spent an extensive amount of time and effort trying to rehabilitate her, but to no avail. Even with surgically placed pins and replacement of dead bone, the damage was irreversible. She was returned to New York on April 17, 1985, where Dr. Edward Becker surgically removed the right wing at the wrist joint. Samantha was transported to Trailside Museums and Zoo on May 10, 1985 on a permanent loan as an educational specimen. She is a very proud and feisty bird, keeping the zookeepers on their toes whenever they have to enter her enclosure. She keeps her feathers very well groomed and always seems to maintain an aura of majesty. It is difficult not to utter an ‘ooh’ or an ‘ah’ when coming upon her. She can be very vocal, delighting and sometimes startling passersby with her piercing call. While we know that Sammi would much rather have spent the last 30 years living her life in the wild, she remains an excellent ambassador of her magnificent species, providing daily lessons on power, grace and hope. The Bald Eagle Restoration Project was an astounding success. There are now more than 170 pairs of bald eagles nesting in New York State. Photos courtesy of Palisades Interstate Park Commission. Post by Chris O’Sullivan, Environmental Educator at Trailside Museum and Zoo at Bear Mountain State Park. Bear Mountain State Park, Doodletown – Jan 5, 2015 – Normally a time of year when New Yorkers head south, on this blustery winter day a Floridian made a rare visit to the skies over Bear Mountain State Park. Fellow League of Naturalists volunteers Gerhard Patsch, Dave Baker, Mike Adamovic, and I watched in amazement as a Crested Caracara soared overhead in the late morning sun. The bird circled several times, drifted north out of view but then returned overhead before heading east towards the Hudson. The field markings and overall gestalt of the bird were unmistakable. To our knowledge, this is the first record of a Caracara in New York State. We later learned that one of these southern raptors was photographed in Berks County, PA just a week earlier, so perhaps our sighting was the same bird blown north by the previous day’s violent winds. Wherever it came from, it was a sight to behold, a tropical apparition on a brisk winter’s day. By Manjith Kainickara (Flickr: Crested Caracara) [CC BY-SA 2.0 (http://creativecommons.org/licenses/by-sa/2.0)%5D, via Wikimedia Commons. 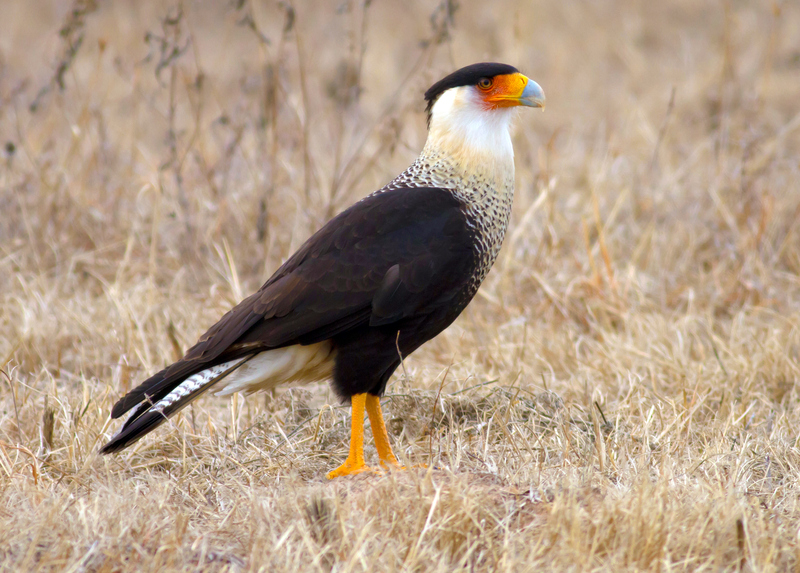 Read about the Crested Caracara sighting in Berks County, Pennsylvania.